The National Water-Quality Assessment Program (NAWQA), implemented by the U.S. Geological Survey (USGS), develops information on streams, rivers, ground water, and aquatic systems to support information needs and decision-making on water-quality management and policy issues. This includes collecting and analyzing data and information on more than 50 major river basins and aquifers in the United States. 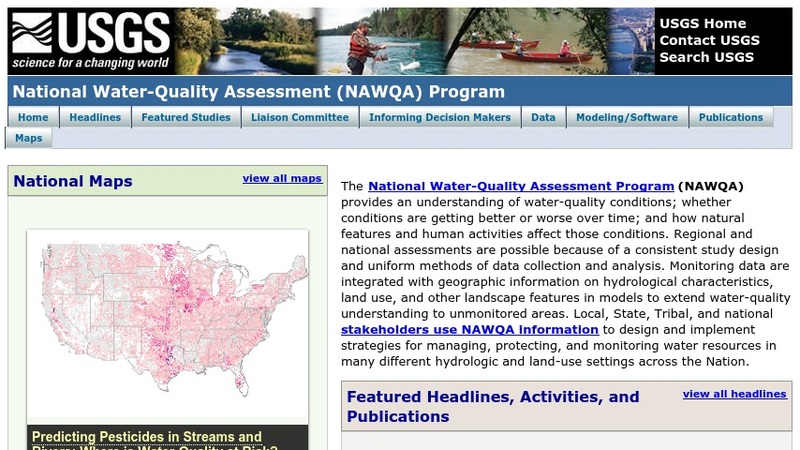 Materials on the NAWQA website include publications and news articles, information on studies conducted under the program, and information for stakeholders to be used in designing and implementing strategies for managing, protecting, and monitoring water resources. The NAWQA data warehouse archives chemical, biological, and physical water-quality data from 42 study units (basins) across the nation, including chemical concentrations in water, bed sediment, and aquatic organism tissues, daily stream-flow information, groundwater levels for sampled wells, biological community data, and other datasets. Other materials include tools for hydrologic modeling and analysis, spatial datasets for hydrologic systems analysis, models for estimating contaminants in unmonitored streams and groundwater, and modeling tools for understanding hydrologic processes.